Feeding time for all my friends. It's hard to find a good deal on a city apartment, as anyone who has ever spent hours trolling on Craigslist will tell you. But sometimes an advertisement that's too good to be true is exactly that. Take this Craigslist post for a D.C. sublet in the expensive Dupont Circle neighborhood. Saw your ad on Craigslist regarding the room in Dupont Circle. At first I was like "What a bargain!" but then I got suspicious. What's the catch? What amazing luck then, to open your listing and find that not only are you offering an amazing rate on a sublet in the heart of D.C., but you're throwing in 16 precious little angels as well! I am a huge cat fan, and I feel like I should be paying you for the honor of spending a month with Polly, Bitnum, Lightning, Lightning II (Question: Is this Lightning's offspring or another cat from a different family whom you've given the same name? 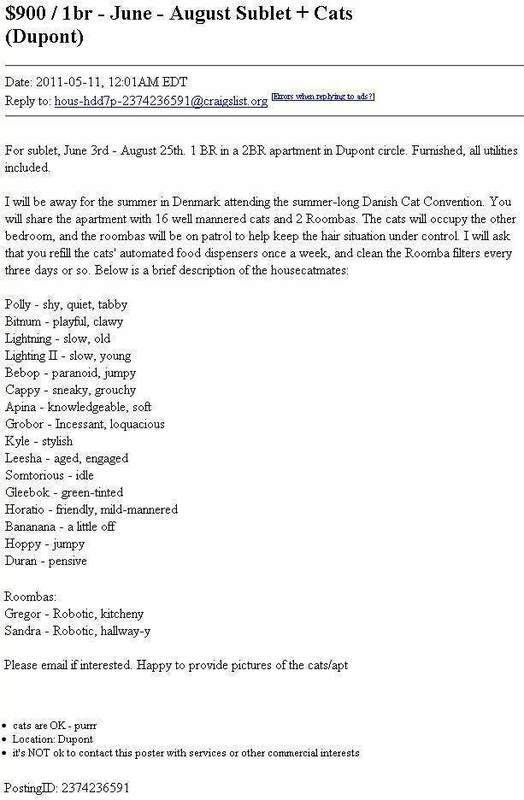 It's a deal-breaker, so let me know), Bebop, Cappy, Apina, Grobor, Kyle, Leesha, Somtorious, Gleebok, Horatio, Bananana (I will assume this is the correct spelling, as I will not live in apartments with cats named after fruit), Hoppy and Duran. I would love to cuddle and hang out with these adorable fluffer-butts all day! In addition, I have two Roombas as well and have been looking for someone who'd be interested in breeding opportunities. Purebred Roombas go for a lot of money these days!